Description of decorations: My biotype is mainly made up of rocks (about 80gk) and amber sand, exactly what you would expect if you try to take a ride inside Tanganyika Lake. A small feature (now completely covered by sand) that has my biotype being a small fortress with an Ammonoidea fossil. Description of equipment: Two Professionel 4+ 600 EHEIM 2275 filters with water flow up to 1250L / H with biological and mechanical filtration, pair of HiLite T5 Marine lights 438 mm / 24. Hydor Koralia for the movement of water 5000l / h, heater EHEIM thermocontrol 250. Water parameters: Temperature 27° C, pH 8.8-9.2, GH 17, KH 8, NO2 0.0, NO3 0.5, ammonia 0.0, electrical conductivity 608-615 (μmho = microsiemens). Description of the area surrounding the biotope: The Tanganyka Lake is located inside one of the great rift valleys of the Rift Valley, whose mountainous walls make up its boundaries, most of the coastline consists of steep escarpments. It has a narrow and elongated shape, and extends for 677 km in a north-south direction with an average width of 50 km. The biotype is concentrated between the Lunzua River, located at the southern tip of Lake Tanganyika and the Kalambo River, which forms the border between Zambia and Tanzania. 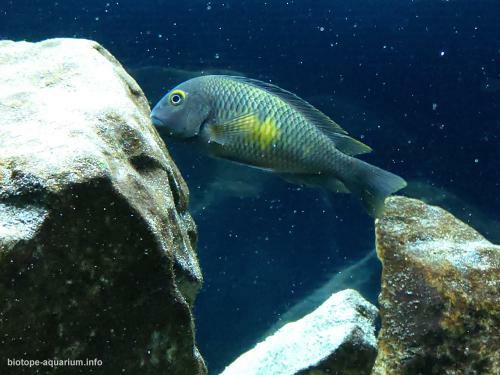 In this area reside in limited quantities, the Tropheus moorii Golden Kalambo. In this area the first research by Toby Veall on the OB-variant (orange-blotched) of the Troph. Kalambo Golden which shows a golden yellow color, with small black spots. The real “Golden Kalambo” on the other hand, is golden yellow throughout the body and extremely rare, it calculates about one every five thousand Kalambo. It was not easy to set up a biotype in such a small space, but my research and the costs to find this beautiful Tropheus did not leave much choice. At least for now. They have a very varied diet, they eat zooplankton, epibentonic invertebrates and aufwuchs, about three / four times a day I add a mixture of feed formed by scales. 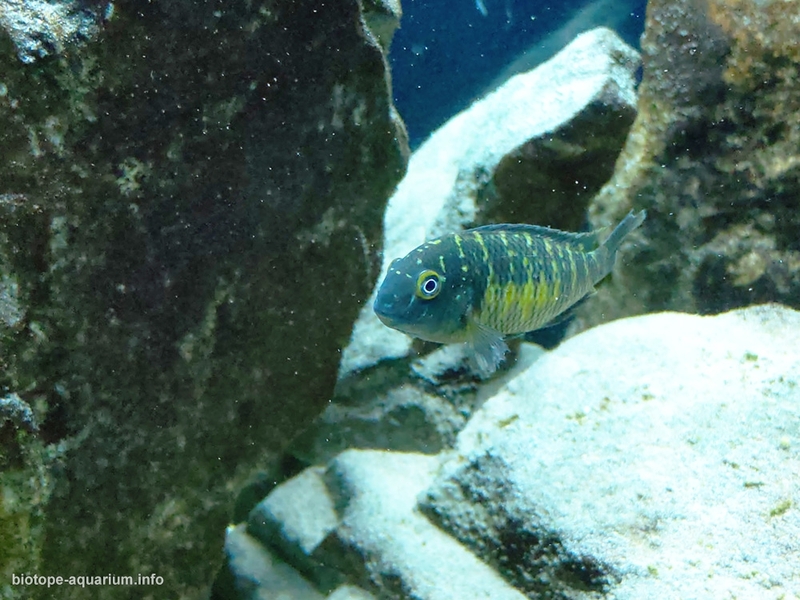 Description of the underwater landscape of the biotope: I tried to present a natural living environment with large natural rocks, coming from eastern Sicily (Italy), arranged so as to create different hiding places both in front of and behind the aquarium. They provide shelter and a place where the main diet of Troph. Moori can grow. Aufwuchs in algae include microfauna as small invertebrates, the amber sand being chosen for the color very similar to the substrate that resides in Lake Tanganyika. Description of the parameters of the habitat: The lake water is alkaline with a pH of about 9 to depths of 0-100 m (0-330 feet). Below this it is around 8.7, gradually decreasing to 8.3-8.5 in the deeper parts of the Tanganyika. A similar model can be seen in the electrical conductivity, which ranges from about 670 μS / cm in the upper part to 690 μS / cm in the deepest. Surface temperatures generally range from around 24 ° C (75 ° F) in the southern part of the lake at the beginning of August to 28-29 ° C (82-84 ° F) in the late rainy season in March-April. At depths greater than 400 m (1,300 feet) the temperature is very stable at 23.1-23.4 ° C (73.6-74.1 ° F). Threats to the ecology: History of the Trop. Moori Golden Kalambo: It all started with Toby Veall, when you discovered about 25 years ago that a morph of Tropheus moorii that resided between the rivers Lunzua and Kalambo, differed from the other species, as it showed a purely golden color, very rare to find from the rest of his “stained” brothers. At that time Toby Veal called only this variety of gold “Golden Kalambo” or “Xanthism”. The word Xanthism is derived from the Greek ‘xanthos’ meaning yellow, and means yellow coloration. T. moorii’s yellow or golden morph is of extremely rare occurrence – for over six years of collection of fish in this area no more than 20 golden specimens were found. 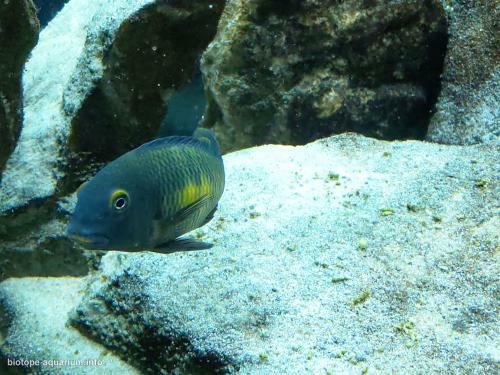 These OB fish are more common (so to speak) and over the years about 50 individuals have been found. Toby Veall Report: When we first collected two or three specimens of the golden morph, we initiated a breeding program, crossing a golden male with a golden colored female. Golden variation. The resulting offspring were largely normal in color. This clearly indicates that the gene, or genes, responsible for the golden coloration are recessive in nature. When we run into the first (F1) generation reached maturity we started to cross the best colored females back to the best colored wild caught males. The offspring thus produced includes a larger percentage of nicely colored individuals – probably in the region of 10%. However, it is very difficult to distinguish fishes with normal color from those which have inherited the golden pattern until they reach 7-8 cm in length. We are able to distinguish the individuals with the color and we plan to cross this generation (F2). In this way we are hoping to produce a pure strain of golden Tropheus. I have never seen Xanthism * in any race of the Tropheus other than the Kalambo form. * (The word xanthism is derived from the Greek ‘xanthos’ meaning yellow, and means yellow coloration). The author Ad Konings, however, also describes the OB variant as pure as the Golden Kalambo, so it does not compromise. This term also prevailed among aquarists. For the most part, a Golden Kalambo is a color morph. Starting from the animals that have “only” some black / yellow / orange points, to the “almost” completely golden. With these words, I hope to give once and for all the right clarification to the many users of the web, who do not have clear ideas on how to identify the Trop. Golden Kalambo OB. 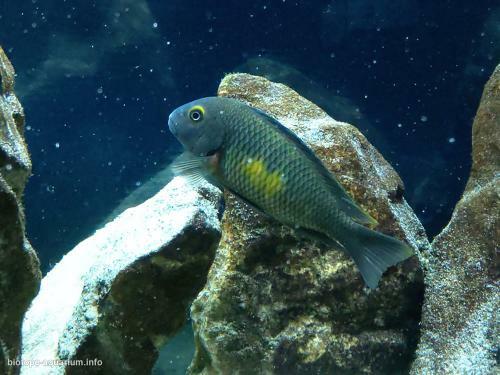 Whether it is covered with a few golden spots or covered with more black spots with orange / yellow fins or with a large golden spot and black caudal fin, or with a face covered with a white spot and a body full of gold, orange and black spots , always remains a Golden Kalambo OB amazing in all its nuances. I conclude by saying that the Tropheus Moori Golden Kalambo OB is a rare, expensive and hard-to-find fish for sale among breeders. 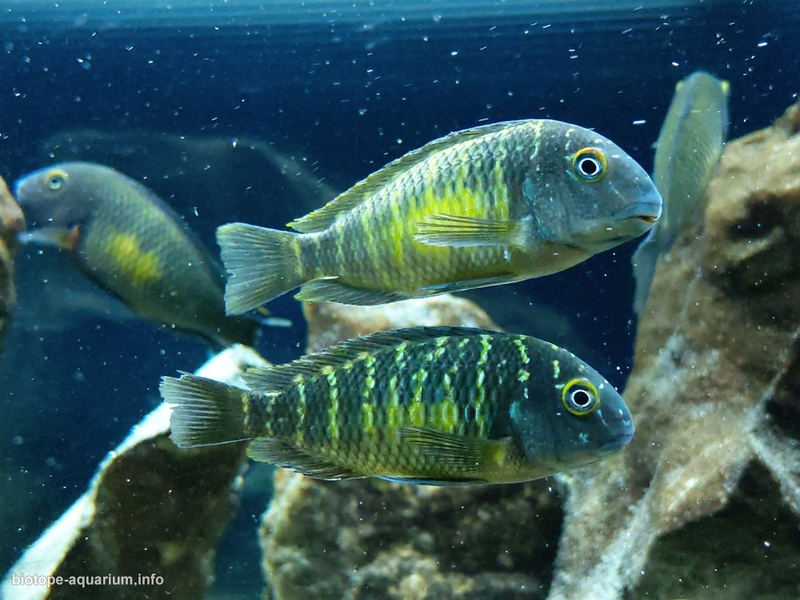 But if it should happen over the years that a Kalambo OB mutates completely in gold, then keep it tight because you will have in your hands a unique fish that is rare, impossible to find anywhere in the world.